Yesterday was Day 7. The last day of Kids Clothes Week Challenge. It’s been a lot of fun, even if I did get frustrated with my dragon wings that I haven’t gotten down quite yet…. So last night I put the dragon wings away and made another tiny girl dress. I’ve had this fabric since before the baby was born, 5 months ago. Thanks to KCWC to helping me get it done! Yep, it’s another reversible one! I can’t just make a simple little dress, nope, not me. Ever since I found this fabric I knew that the side with the birds, snails and trees was going to be the main side and the blue striped side was the inside fabric. But now that it’s done, my favorite is the blue! Which is your favorite??? Now onto birthday party decorations and toys!! Well, I did sew on Day 6, but nothing to really show for it… I tried to master the Dragon wings again. Totally fixed one problem, but there’s still a flaw.. So, more to come on that one. And it’s not kids clothes, but it’s for a baby. I made a sling turned photography prop. Unfortunately I was sick this morning and wasn’t able to photograph the baby in it. rescheduled. So, once again, more to come on that one. But tonight, I am making another cute little dress…. Gotta go finish! Dragon Tales, Dragon Tales, It’s almost time for Dragon Tales. Come along and take my hand, Let’s all go to Dragon Land! Almost everyday in this house we have to get a few minutes of Dragon Tales in. We ask if the kiddo wants to watch anything else, but nope. So, this all leads me to last night’s project…. Dragon Wings! No tutorial here. Just a dry run… Maybe, I’ll make a tutorial! Hmmmm… There were a few flaws in my design, but with the help of my husband we’ve worked out the kinks in the design. Dragon wings set 2 will be perfect! 🙂 I’ll try that as part of tonight’s project. Again, last night was a two project night. I finished up the art piece for the Postcards from the Gulf Benefit and finished transforming Max’s robot shirt from a short sleeve shirt into a long sleeve shirt. As I was sewing on the long sleeves, my husband looks over and says, ‘Not for nothing, but…’ Whenever he starts a sentence like that I know he’s wondering why I am doing what ever it is I am doing. So he continues… ‘Wouldn’t it be just as easy to buy another 3 or 5 dollar t-shirt?? ?’ Well, dear, probably so, but…. I wanted to try this tutorial out and make something ‘new’ so that’s what I did! I used the tutorial from Make It and Love It for adding the sleeves. Super easy once you get the hang of moving it around in the sewing machine. Tonight, back to the full on KCWC! hmmmm, what will it be?? This is another project that I’ve blogged about before, but can now post the finished piece. Which I have to get in the mail, ASAP…. My piece is a collage interpretation of growing up on the Gulf and visiting the wonderful beach house that my grandparents purchased long before my days! The collage combines images from my photography of our trip this year, before our beaches were hit with any of the oil. Oh, and the ladies from yesteryear are my husband’s mother and aunt. I wish I knew what number pier this one is. They blow away and get rebuilt over and over. What a fitting metaphor for what our environment is going through now. On Oct. 12, the Postcards from the Gulf website will be activated to provide a preview of the collection and info on participating artists. I’ll post the web address when it is available. On Nov. 5, the Postcards from the Gulf website will enable online purchasing, and postcards may be purchased directly from the site. Pre-sold postcards will be marked with a small sticker during the gallery night, and out-of-town purchases will be shipped on Monday, Nov. 15. Postcards may also be purchased in person at gallery night. This project is going to be a two-part project. Last night I added the robot applique to a t-shirt. This is a project I’ve been wanting to do for over a year now! The applique is actually from a baseball cap that we got for Max. For some reason we bought it too small and he never wore it, but I couldn’t just get rid of the cap because we loved the robot. So I cut the cap apart, aligned the two pieces of the hat and made an applique! Part 2 will be making the t-shirt a long sleeve shirt for the winter using one of Dad’s old t-shirts that I raided from his Goodwill bag! Jeans. I went with the jeans project for Day 2. Recycled jeans, that is. I started with a pattern, made by yours truly, from another pair of pants. Then cut the pieces from an old pair of my jeans. Using this tutorial from CookCleanCraft , ta da…..
Ahhhhh, the elusive pillowcase dress! I’ve always wanted to make one of these, and now I can check it off my list. The only thing is that technically this isn’t a real pillowcase dress. So I can’t completely mark it off my list since I want to do it again some time and make a real pillowcase dress out of a pillowcase! This one should more correctly be called a table runner dress. It started its life out as a table runner. I found the fabric at a thrift shop and wanted the green for a quilt I was designing. But once I saw the fabric with the great design on it I thought, little girl dress. And here it is, in all it’s reclaimed pillowcase style dress glory! And on top of that I made it reversible! The other side isn’t quite as exciting, but it’s still kinda cute! I’m totally obsessed with the KCWC and figured instead of just working on something one hour a day, which is the challenge, I’ll try to make one thing each day! We’ll see how that goes. So my first project was something I’ve been wanting to do for ages… The pillowcase dress. I started with the pattern from the ladies at Prudent Baby. Since mine is reversible, I didn’t follow thier tutorial exactly, but… Very nice directions over there! But to top it off, the first night of the challenge was also the first night of Dancing With The Stars, my (as much as Joe cringes when I say this) most favorite TV show! So I had to pack all my sewing stuff upstairs to watch. Now I have to pack it all back downstairs to work tonight! Let’s see what tonight brings… Another dress? Little guy jeans??? Somehow I found this blog the other day, http://www.elsiemarley.com/. Love it! 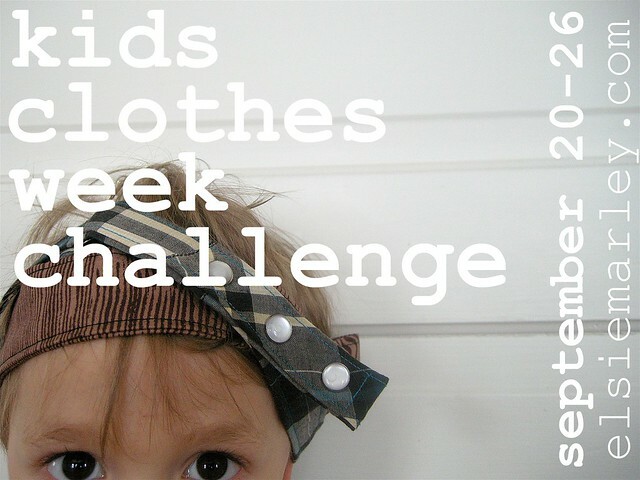 I found it just in time to sign up for the kids clothes week challenge! I’m totally excited about it. She has great inspiration. I have so many things I want to make. I still have a couple of projects I have to finish before kcwc, but I can’t wait!!! 🙂 Should I really be this excited about this challenge?